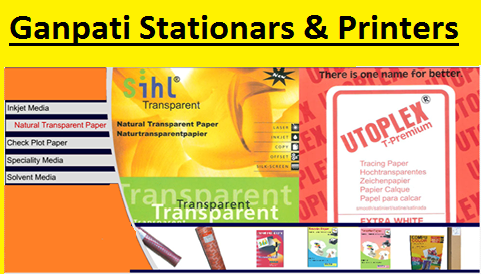 SIHL TRACING PAPER ROLLS AND SHEETS UTOPLEX TRACING PAPER IN ROLLS AND SHEETS GEM PLOTTER PAPER FOLEX OHP FOR COLOUR INKJET AND LASERPLUS print OHP, PLOTTER PAPER, LASER PRINTING FILM (LPF), MULTI-TECH PAPER MULTIPURPOSE PAPERS FOR COLOR COPY / COLOUR LASER T SHIRT TRANSFER PAPER FOR DARK AND LIGHT CLOTHS COMPUTER COLOR INKJET MEDIA IN ROLLS AND SHEETS, GLOSSY PAPER ROLLS ,CHAPDI, PACKING TAPE ,STRETCH FILM , CALCULATORS,COMPUTERS AND CONSUMABLES,PANFIX TAPE, XEROX PAPER, JK COPIER, MAX JAPAN, SDI STAPLERS, SCISSORS, OFFICE STATIONERY AND EQUIPMENTS, HP TONERS, HP TONERS TALLY ERP 9 NORTON INTERNET SECURITY . QUICK HEAL , K7-ANTIVIRUS. SIHL TRACING PAPER ROLLS AND SHEETS UTOPLEX TRACING PAPER IN ROLLS AND SHEETS GEM PLOTTER PAPER FOLEX OHP FOR COLOUR INKJET AND LASERPLUS print OHP, PLOTTER PAPER, LASER PRINTING FILM (LPF), MULTITECH PAPER MULTIPURPOSE PAPERS FOR COLOR COPY / COLOUR LASER T-SHIRT TRANSFER PAPER FOR DARK AND LIGHT CLOTHS COMPUTER COLOR INKJET MEDIA IN ROLLS AND SHEETS, GLOSSY PAPER ROLLS ,CHAPDI, PACKING TAPE ,STRETCH FILM , CALCULATORS,COMPUTERS AND CONSUMABLES,PANFIX TAPE, XEROX PAPER, JK COPIER, MAX JAPAN, SDI STAPLERS, SCISSORS, OFFICE STATIONERY AND EQUIPMENTS, HP TONERS, HP TONERS TALLY ERP 9 NORTON INTERNET SECURITY . QUICK HEAL , K7-ANTIVIRUS.